It had very limited jurisdiction — it could hear only one kind of case, and only in six named areas. And it created a set of records that can knock a genealogist’s socks off. It was the Court of Private Land Claims. Whaddaya mean you never heard of it? Why everybody’s heard of — I mean — well — okay, don’t feel bad. The Legal Genealogist hadn’t heard of it either, until I literally stumbled across it while researching something totally different. Can we say “patronage,” boys and girls? Maybe even “bribery and corruption”? Yeah. Not the very best way to handle lots and lots of land worth lots and lots of money. 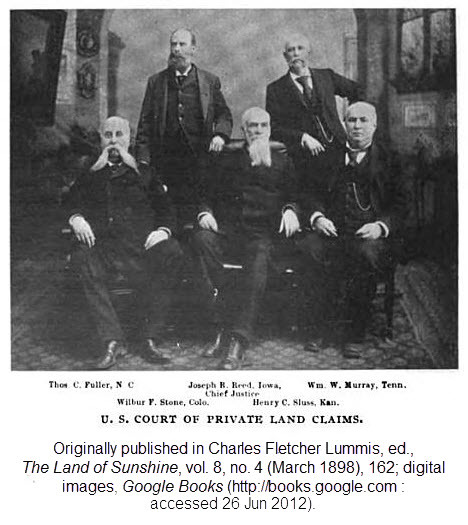 Starting in the 1880s, reformers started trying to get a law passed to create a court to review the land claims. Finally, in 1891, they succeeded,7 and so was born the United States Court for Private Land Claims. Dealing with the claims took time. So the court’s life was extended from 1895 to 1897,12 then to 1899,13 then to 1900,14 to 1902,15 to 190316 and, finally, to 30 June 1904.17 Its operations ended at that point. • Some of these case files are available online in the Thomas B. Catron Papers of the University of New Mexico’s Center for Southwest Research Digital Manuscript Collections. Either search the collections using the search boxes or click on the Catron Land Grant Cases to browse the files. They’re also available on microfilm. • In its “Land Grants of New Mexico,” the New Mexico Office of the State Historian sets out a history of many of the grants in New Mexico and what became of them. And see “Land Grants,” the New Mexico Commission of Public Records, State Records Center and Archives, Archives and Historical Services Division, with a more detailed bibliography of resources for further research at the New Mexico State Archives. It’s clear that there’s more out there — from the other territories and states, for example — but the wealth and depth of this material is stunning. Just in the New Mexico materials, there are documents created between 1682 and 1846 obtained starting in 1855 by the Surveyor General of New Mexico in support of claims.22 Names, dates, places, inheritances, relationships — all spelled out in support of claims. And all from a court it’s a sure bet most of us had never heard of before. Amazing, Judy. Wish I had relatives down in that area – but I know it will be useful for other people I know. Thanks so much for your wonderful must-read posts! They keep reminding me once more – there may be one more resource to search for. There’s always one more resource out there. It’s finding it that gives us running fits! Amazingly, Bill, some of these cases are still being litigated today, not between the US and a claimant but between different people arguing their own private rights!